FINALLY SOCKS THAT HAVE ALL THE FEATURES YOUR FEET DESIRE: Cushioned soles for comfort. Ventilation arch bands to keep your arch supported and feet cool. Seamless toe seams for extra coziness. Perfect fit with 4 adult sizes to choose from. YOUR FEET DESERVE THE BEST: All Rymora products are designed by a University of Cambridge 1st Class Masters Engineering Graduate so you can be sure they’re designed with the precision that your feet deserve. ORDER NOW: Don’t delay, click Add to Basket now and join the thousands of others benefitting from these super soft and highly rated trainer socks. • Say hello to premium quality socks that your feet will fall in love with at first sight. • Cushioned soles for comfort. • Ventilation arch bands to keep your arch supported and feet cool. • Seamless toe seams for extra coziness. • Perfect fit with 4 adult sizes to choose from. • All Rymora products are designed by a University of Cambridge 1st Class Masters Engineering Graduate. • We work hard to ensure we only bring quality products to market – this is reflected in our Amazon 5-star product review ratings and also extremely low returns rate (<1%). 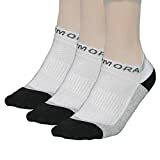 • Your feet deserve the best, buy Rymora and you won’t have any regrets. • We’re confident that you’ll love our products. But for your peace of mind, in the unlikely event that you don’t like any of our products simply return it within 30 days for a full quibble free refund. • Don’t delay, click Add to Basket now and join the thousands of others enjoying these premium quality socks.